PHOTO BY JACOB GURNEY Personnel watch for traffic at the scene of a single-vehicle rollover accident on South CR 7 Sunday evening. BASCOM — A man was injured in a single-vehicle, rollover accident on South CR 7 Sunday evening. Crews also reponded to other accidents Sunday. Trooper Donte Hanns of the Fremont post of State Highway Patrol said Mohammad Ammar, 21, of Cleveland, was traveling south on South CR 7 in a 2002 Toyota Camry. Ammar lost control of the vehicle, went off the right side of the road and overturned, he said. Hanns said Ammar was taken by Bascom EMS to ProMedica Fostoria Community Hospital to be treated for non-life-threatening injuries. Ammar was cited with failure to control, he said. Hanns said the weather was a factor in the accident. Ammar was wearing a seatbelt, he said. The accident was reported at 5:26 p.m. and Bascom EMS, Bascom Joint Fire District, the Echo unit, State Highway Patrol and John’s Welding & Towing responded to the scene. Two people were injured in an accident at SR 53 and TR 92 Saturday afternoon. Jenna M. Bentley, 25, of New Riegel, was traveling south on SR 53 with Susan E. Bentley, 57, of New Riegel, according to a Fremont post of State Highway Patrol release. The release states Jenna Bentley attempted to turn right onto TR 92 when she began to lose control of the vehicle on the snow-covered road. Jenna Bentley then over-corrected, crossed the center line, went off the left side of the road and then struck a ditch and struck a tree at 4575 SR 53, it states. 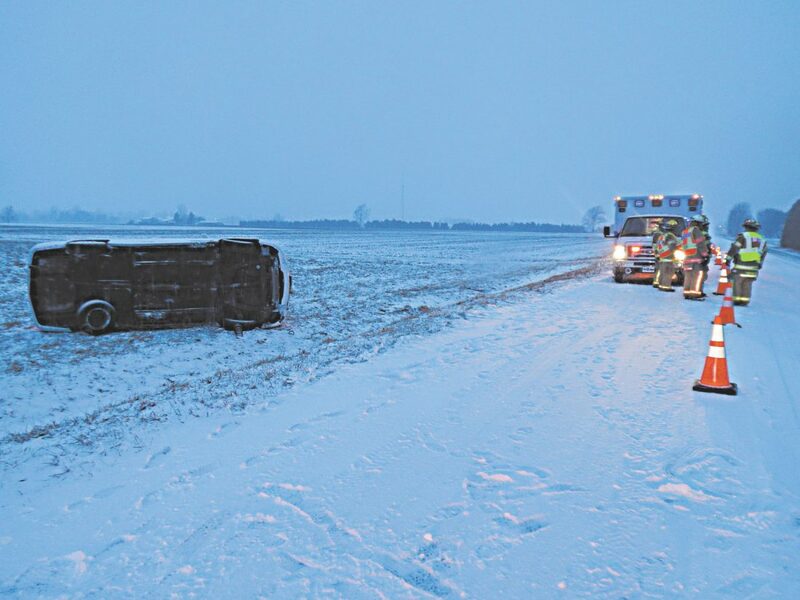 Trooper Stephen Vanderford of the Fremont post of State Highway Patrol said both women were transported by NBS EMS District to Mercy Health — Tiffin Hospital to be treated for non-life-threatening injuries. The release states Jenna Bentley was cited with failure to maintain control of a motor vehicle. The accident was reported at 4:10 p.m. and NBS EMS District, Sycamore Volunteer Fire Department, the Echo unit, State Highway Patrol and D&D Towing responded to the scene. Sunday morning in non-weathered-related accident, a man was injured at SR 53 and West CR 30. Deputy Denny Wilkinson of Seneca County Sheriff’s Office said Bill L. Tracy, 71, of Tiffin, was stopped facing north on SR 53 waiting to turn left on West CR 30 in a 2008 Ford cargo van. Brandon T. Garber, 20, of Fremont, was traveling north on SR 53 in a 2011 Ford Taurus, he said. Wilkinson said Garber didn’t see the van stop, couldn’t get stopped in time and rear-ended the van. The van struck a road marker, spun around and ended up in a yard on the west side of SR 53, he said. Wilkinson said Tracy was transported by North Central EMS to Mercy Health — Tiffin Hospital with non-life-threatening injuries. Garber was cited with assured clear distance ahead, he said. Both drivers were wearing their seatbelts, Wilkinson said. The accident was reported at 11:57 a.m. and North Central EMS, Old Fort Volunteer Fire Department, Seneca County Sheriff’s Office and John’s Welding & Towing responded to the scene.